Purely by accident or fortuitous coincidence I ended up spending Pride week and the week following immersed in Daniel Zomparelli and Saleem Haddad and in hindsight I would have it any other way. Puns and/or innuendos unintended. Daniel is one of my favourite people. 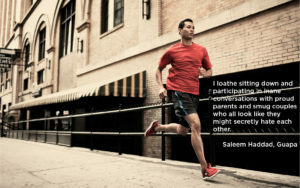 I’ve never met Saleem. I spent the midday last Sunday standing at the corner of Robson and Nicola watching the Pride parade and noting that it’s a lot more family friendly and a lot more commercial than I recall from years past. Maybe it’s crept up on me; I don’t remember noticing before (mind you I was out of town last year and missed it). I’m not sure how I really feel about this, or how I’m supposed to feel about it, but I’m curious to know how people within the community feel about it. Maybe it’s not a big deal. I do think that Davie Street Translations is an important historical artifact, albeit only a few years old, that deserves widespread attention. Guapa is the book that I was expecting/hoping that (the comparatively mediocre) God in Pink that I lamented back in January on here (week two) would have been. I’ve become a sponsored athlete, just in time for the 2016 Rio Olympics. They have nothing to do with each other. And not really. Not really at all. My employer has decided to subsidize athletic activity on a monthly basis, so I got myself a membership to the Robert Lee YMCA that’s just about a block from my apartment, and I’ve been swimming nearly daily for the past couple weeks. And I’m terrible. But I like that I’m terrible. I also like that I’ve managed to maintain a decent average running session and distance throughout this additional activity, though I’m exhausted. Swimming now brings back memories of when I first started running and I could only last a couple kilometres; swimming, I can barely last beyond a lap. It’s humbling, and I’ve fallen in like with it. I might even sign up for a lesson or two. But I’ll probably just keep on with my spastic splashing.